Tufts University declines to divest and students respond. This was originally published as an op-ed in the Tufts Daily and is reprinted here with permission. As members of President Monaco’s Tufts Divestment Working Group, it quickly became clear to us that the group hadn't been created for “open discussion” about the possibility of divestment from fossil fuels, as Monaco claimed. Instead, it existed to generate financial models supporting the administration’s expectation that it was financially impossible. In one of our committee meetings, Patricia Campbell, the executive vice president of our university, admitted that divestment could indeed be feasible—but it was clear to us that the administration wasn’t willing to consider the changes to Tufts’ investment strategy that divestment would entail. It was this lack of consideration given to fossil fuel divestment that colored the working group process and left us disappointed by our administration’s utter lack of good faith in its approach to the issue. In his Davos address, Kim said, “Corporate leaders should not wait to act until market signals are right and national investment policies are in place,” yet our administration continues to claim that Tufts should wait for the carbon bubble to burst before taking action. Meanwhile, many corporate and institutional leaders are already taking leadership. Mayors of cities including Seattle, Madison and our own Somerville are pursuing divestment. Norwegian financial services firm Storebrand, which controls more than $60 billion in assets, has announced its intention to pull its investments out of coal and tar sands companies to ensure “long-term stable returns” because they know that those stocks will be “financially worthless” in the future. In January, the CEO of Google joined sixteen other managers of charitable foundations in divesting their assets from the fossil fuel industry. The list goes on. Our administration and trustees declined to join these other institutions not because they are unintelligent or misinformed but because they are afraid. Perhaps some of our trustees are afraid to consider that the profits they have gained from their investments in fossil fuel companies have accumulated at the cost of a stable climate and human lives. We have heard both President Monaco and trustee Laurie Gabriel admit that divestment is the moral choice, but they are afraid to challenge one of the largest, most powerful industries in the history of the world. They are afraid to take leadership. We, like so many of our fellow students, chose Tufts because we believed it was a place that valued ambitious leadership, bold innovation and active global citizenship. These are the values that Tufts promotes to us throughout its admissions process, in the classroom and ultimately, in the paths we take after graduation. We are expected to lead, make moral choices and improve our society. But the recent announcement that Tufts will not divest showed that our administration is failing to live up to its own values. We have seen this lack of ambition from our institution many times before. It took forty years for Tufts to create an Africana studies department. It took more than a decade to divest from apartheid South Africa. We don’t have a decade now. We do not have the luxury to be anything short of ambitious. Not when too many communities are already fighting for their lives, for clean air to breathe, clean water to drink and food to eat. Not when the fossil fuel industry imperils our generation’s ability to live, work and raise children in a stable and just world. 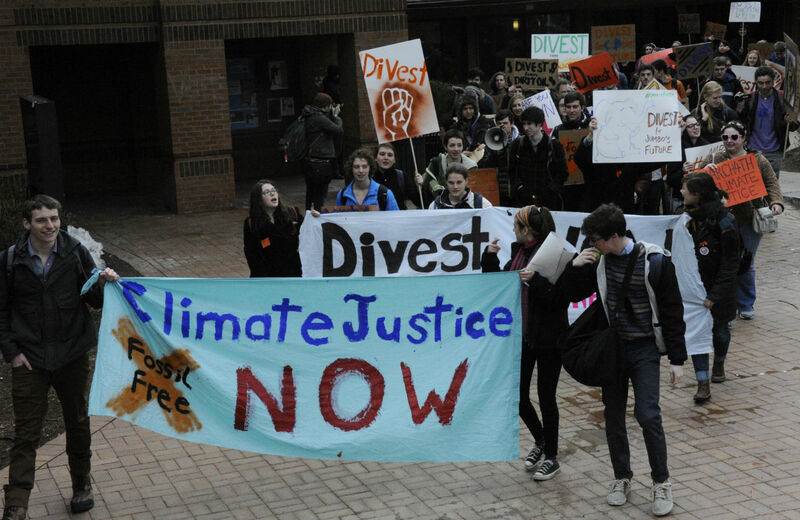 The student body showed its support for divestment last semester in a referendum. We know that we, the student body, have the moral clarity and ambition that our administration has failed to show. Tufts will not change unless we fight for that change. So we ask that as this campaign moves forward, you stand with us to make Tufts a place that we can be proud of, for the sake of our future.